Mwanawasa’s legacy: What is it? Nowadays, there is a clique of Zambian politicians who appear to have discovered a new word in the dictionary, and this word is actively competing with such buzz words as recession, meltdown, downturn, and crunch. Yet, not too many of these politicians even know the strict meaning of the word they have been parroting ever since they realized that no two persons can ever be the same. The word is “legacy”. For many of the people using this word, it would appear as though it only came into use after the death of President Levy Mwanawasa last year. Or more like the title State Council seemed to have come into existence only after Mr Mwanawasa became Zambian president in 2001. But this is Zambian politics. Hardly a day passes without one or two politicians screaming that President Rupiah Banda has departed from his predecessor Dr Mwanawasa’s legacy. If any of these politicians were asked to pinpoint the legacy that they expect President Banda to uphold, they would have problems doing so. While it is true that President Banda may have won last year’s elections partly due to the late president Mwanawasa’s name, it must be appreciated that a president is never elected to uphold a predecessor’s legacy. Even Dr Mwanawasa won the 2001 elections on the back of Dr Chiluba but he pledged provide “continuity with change”. That was by no means a sign of ingratitude to Dr Chiluba who picked him from outside the MMD inner circle to become presidential candidate for the 2001 presidential elections. Indeed, Dr Mwanawasa proceeded to be different from the man who had handed him the presidency almost on a silver platter. The reason is that a president swears to uphold and protect the Constitution of the land and not that of the departing president. This is because a president is expected to provide leadership based on his judgment upon which he would be judged after leaving the position. The biggest question that must be asked to those who daily singing about Dr Mwanawasa’s legacy is: What was President Levy Patrick Mwanawasa’s biggest legacy? This is a fair question that must be answered by even those that do not like President Banda. Thirty-nine months ago, President Mwanawasa called a Press conference at State House to name a new Cabinet following the 2006 elections which, that time around, he had won using his own name and not that of Dr Chiluba. President Mwanawasa’s blue-eyed vice-president Lupando Mwape had just been defeated in his Lukashya parliamentary constituency and would, therefore, not be re-appointed to his position. Dr Mwanawasa had to decide and, like Dr Chiluba in 2001, he went outside the MMD inner circle to pick a former Cabinet minister, diplomat, farmer, businessman and committed family man in the name Rupiah Bwezani Banda. Mr Banda had orchestrated the MMD’s grand triumph in the Eastern Province, garnering an unprecedented 15 parliamentary seats from a region that the Forum for Democracy and Development had shared with the United National Independence Party. In appointing Mr Banda as republican vice-president, Dr Mwanawasa was quite blunt in explaining why he had arrived upon that decision. Dr Mwanawasa said the Northern Province had rejected vice-president Mwape and, because of the overwhelming support from the Eastern Province, he was giving the vice-president to that region. The decision was welcomed by nearly every Zambian, including those that now criticize President Banda on a daily basis as if he became a devil after declaring serious intentions of standing for the presidency after Dr Mwanawasa’s demise last year. With that decision of appointing Mr Banda as his number two, Dr Mwanawasa’s political fortunes warmed up and he got the support he required up to the day he entered his grave at Embassy Park. Mr Banda brought in the savvy that Dr Mwanawasa lacked and has continued to display that mature leadership even in his current position as republican president. Even as those who claim to be protecting Dr Mwanawasa’s legacy openly insult him in spasms of anger, he does not respond, as his is a more honourable and onerous task of steering the national ship into safe waters amid unavoidable political turbulence. Anger, it is said, is never without an argument, but seldom with a good one. So the argument that President Banda has sidelined the people who were close to Dr Mwanawasa is not a valid one and deserves all the scorn it deserves. When President Banda won the October 2008 elections, the Eastern Province had, once again, proved to be true partners of the MMD as they voted unanimously in favour of the ruling party. Like Dr Mwanawasa in 2006, that could have been a good reason to give the republican vice-presidency to the Eastern Province. But what did President Banda do? He picked one of Dr Mwanawasa’s loyal lieutenants and long-serving Justice Minister George Kunda as his vice-president. Perhaps one of the people who have been insulting President Banda expected to be picked for that position despite the glaring inadequacy and lack of civility. 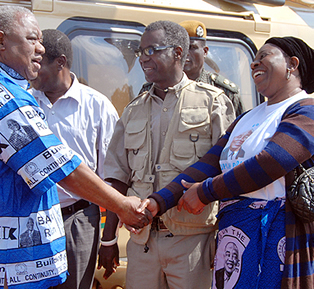 President Banda also re-appointed many of Dr Mwanawasa’s friends and relatives from the so-called family tree. He retained the likes of George Mpombo, Gabriel Namulambe, Lwipa Puma, Gladys Lundwe, Mike Mulongoti as ministers while Bank of Zambia governor Caleb Fundanga has continued in that position. It is not a secret that some of these people did not even deserve these positions as there are others with better credentials. A lot of Dr Mwanawasa’s kith and kin are still serving in the foreign service while the likes of the hardworking Chisamba member of Parliament Moses Muteteka have earned themselves ministerial positions. Not to be left out is Dr Mwanawasa’s sister Evelyn who serves in the MMD national executive committee and is close to President Banda. This clique claiming to have the support of Lamba chiefs is headed for doom and now wants to ride on tribalism to gain political muscle. In fact, President Banda, who abhors tribalism, has been too patient with some of these tribalists. Dr Mwanawasa would not have been that patient with the flagrant indiscipline, which only exposes their inability to exist in a civilized political set-up. Patience is a virtue, and President Banda has exercised it to the limit. What a choice Dr Mwanawasa made for his successor! President Banda is Dr Mwanawasa’s biggest legacy.